Faith Ministries is selling some of our sound equipment we no longer need through a series of upgrades. Here is a list of the equipment complete with details and our asking price as well as contact information. All equipment is available for inspection at Faith Ministries in Lafayette, IN. 48+2 channel console complete with 2 redundant power supplies, talk back mic, and light kit. This console was purchased and installed at Faith Baptist Church in 2003 and has only been used in this fixed venue. It is in great shape and has recently been cleaned. In 2008 the console was serviced and several LED lights were replaced. In addition the Direct Outs on each channel were switched from post fade to pre fade. Console has a few LED lights that are out but easily replaced. There are also 2 channels on the board that are not working however since we replaced the console we haven’t done additional troubleshooting to see if the channels are bad or there were other connection issues outside of the board. Due to the size and weight of this console (approx. 400 pounds) we are unable to provide shipping or delivery. 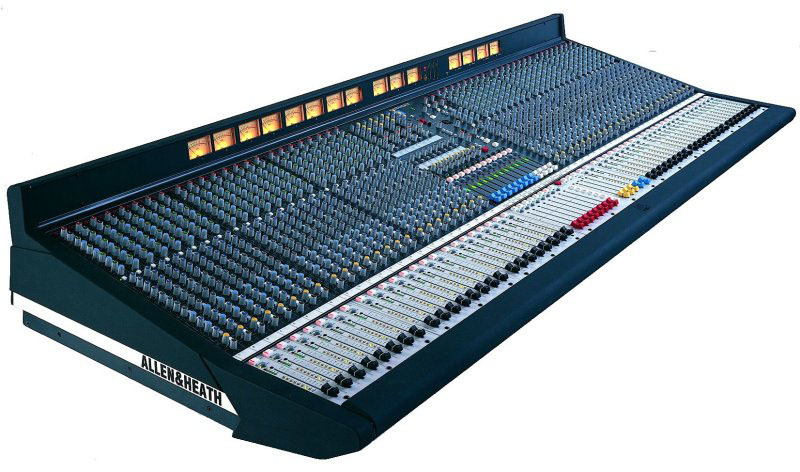 The Allen & Heath ML4000 is a large format VCA equipped dual function live sound console providing many of the features of its larger brother the ML5000. It can be quickly configured for front-of-house (FOH) or stage monitor mixing. As one console suitable for both applications it is equally well suited to installation, rental and touring. It offers an IO capability and feature set that satisfies the latest trends in live sound engineering, in particular the growing number of inputs and outputs for multi-speaker house and monitor systems, demands of stereo in-ear monitoring, 3 speaker LCR imaging, advanced grouping and automation. The design ensures on-the-road durability, a clear layout for easy walk up and go operation, and no-compromise audio performance. We have 3 of these units. 1 was purchased and installed at Faith Baptist Church in 2008 and the other 2 in 2009. They have only been used in this fixed venue. These units can be shipped and shipping costs are the responsibility of the buyer. The compressor/limiter is followed by a full-featured gate with attack, release, and threshold controls; a gate-range switch, which determines the amount of level reduction that occurs when the gate closes; and a sidechain/key insert loop that enables the gate to be opened, or keyed, in response to a modified version of the program signal or some other external source. With eight dynamics processors in one unit, you can employ tricks that aren’t possible with lesser processors. The Channel Link feature lets you lock together as many channels as you wish, so that all processors follow the setting of the master processor. Since you can create multiple simultaneous link groups, you could link a stereo pair of channels plus a group of four processors and still have two unlinked channels for other applications. Some people say they don’t make signal processors the way they used to. Nonsense. The ACP88 is a superb old-skool processor, with physical knobs and switches for every parameter, shoehorned into two rackspaces, and it delivers a pure analog sound that will always be in style. On Twitter today I posted a few things griping about this Google+ thing. Since Google+ thinks it is the center of the universe I am not able to send those tweets to Google+ however if I posed to Google+ originally then I could send the post to Twitter and Facebook only if I download an app and install it into Chrome and only if I use Chrome as my browser of choice when doing said posting. The problem here is Google+ is trying to become the core of everything while still being the new kid on the block that lacks a ton of integration features. Right now I use TweetDeck to send posts to both Twitter and Facebook. TweetDeck said recently they had no plans to add support for Google+ meaning I'm now posting the same thing multiple places. Google has even created dissention within its own ranks as Buzz doesn't link to it and neither does Blogger. As a result I'm also manually posting this to my blog as a blog post. Seems to me that Google has released a product that in many ways is cool and has some features superior to Twitter and Facebook but that is also lacking the ability to play nice with them. It is the immature child on the block that needs to grow up quickly and learn to get along with others or risk not being included with the rest of the gang and spending a lot of time playing by itself. Why Are We Going Broke? I typically don’t post a lot about politics because the issue is obviously contentious, as most folks can’t separate their political views from their personal biases about individual politicians, groups, or political parties. As a result their views change based on the “who” as opposed to any strong beliefs or convictions. I’m amazed at the current state of our great nation’s finances. Four years ago, our Legislative branch, and Executive Branch started authorizing massive spending programs to help our economy recover from a recession. Two years ago, these branches, after an election cycle, continued this practice and added even more spending to it in terms of health care reform with the tag line that these reforms were going to save us money. Now we are broke having apparently over spent to the point that we need either to cut spending or increase our debt ceiling. Changing gears this fast in a car will strip your transmission and I’m curious what it is going to do to our government and our nation. Over spending is never an answer, even if that overspending helps me out. Our political process has also turned the taxpayers into a pawn for re-election. Am I happy that taxes are at an all-time historical low? You bet! Am I happy that our nation is broke? Not at all. Unfortunately, our policies swing based on the needs of our politics and what our government does now seems to be done without respect for the future. Before we couldn’t spend enough to save ourselves, now we can’t save enough to save ourselves. There has to be a better way to govern then one that lives at the edge of the extremes. Perhaps our nation could learn from the great state of Indiana. Our state has not been governed on the extremes. Is it perfect? No, but our budgets is balanced, our taxes have not increased and we have over a billion dollars in reserve. It isn’t easy but we know it can be done. A few weeks ago, the Casey Anthony trial ended with a not guilty verdict and immediately the internet and social media services went crazy with armchair pundits commenting as though they knew more than the jury did. What makes this more interesting is a few days after the verdict I headed to Florida for the final Space Shuttle launch and down there the locals all had an opinion. While we may all have an opinion, we are not all experts. We may have watched the trial on TV but that doesn’t make us an expert. We don’t know exactly everything the jury knew or what evidence they were allowed or not allowed to consider. I don’t agree with how the defending counsel handled the situation with the media but I certain understand why they responded how they did. It also fascinated me how worked up some people were about this and how many believed justice had been thwarted that day. Maybe I’m crazy but I just don’t care that much about it. Besides, someday everything, the right and the wrong, will all be judged by a much higher power than a Florida court or millions of couch potatoes. There are more important things in this life. Last week I attended the final launch of the Space Shuttle program, the launch of Atlantis on STS-135. While packing for the trip I grabbed a change purse full of nickels and dimes to burn up on the numerous tolls around Orlando. I had no idea how problematic this change purse was going to be. My “change purse” was actually a leather bag with a zippered top intended to keep the change organized. I really didn’t think much about throwing it in my TSA approved backpack. I have my routine down for going through security at the airport. I place my watch, wallet, and cell phone in my backpack. Then my liquids and shoes go in one of the bins. Since my bag is TSA approved, I don’t have to take my laptop out. I also keep my chargers, USB cables, and other wires in an old mic bag so they are all together. Cables strewn out inside a bag will almost always get your bag rummaged through. This system has kept me from being searched for over 2 years, no checks, searches, explosive swabs, nothing. That is until last week. My backpack came through the x-ray and the lady told me there was a change purse in there and the x-ray couldn’t see what was behind it. I told her right where the change purse was but she couldn’t find it and in the process unpacked the entire bag. I don’t envy the TSA folks their jobs but I told her specifically where it was as that is all they needed to x-ray but she never found it. After unpacking most of the bag, she sent everything through again and then said it was ok. She handed me my bag and I put my hand in and pulled out the change purse. She said it would be best to put the change purse in the bin with my shoes and liquids as the x-ray can’t see through all the change. I travel frequently and this was the first time I had heard that. I asked her why it wasn’t posted anywhere and she didn’t have an answer. I got to relive this story each time I pulled change out and paid for various tolls around Orlando but I learned something new – if you have a mess of change pull it out and send it through with your shoes. This is one of those unspoken rules you will only learn through personal experience or learning from the experience of others. Here’s to the next 2 years and hopefully no more bag searches. The final details have come together for our STS-135 launch trip. All the spots are filled at the private location where I will be viewing the launch from. I am interested in Causeway tickets but am not willing to pay the greedy prices currently being listed on eBay. This will be a fun trip as I connect with friends from the launches of STS-132, 133 and 134. I'm also looking forward to a tour of the Cape Canaveral Air Force Station - a place I have been once....secretly. This launch is history in the making as our great nation, which just celebrated its 235th birthday, gives up the ability to fly humans into space and instead chooses to rely on our former Space Race competitors in order to reach low earth orbit. As we watch the last space shuttle escape Earth’s gravity I wonder how history is going to repeat itself. The last manned flight from the Apollo missions was in 1975 and the first space shuttle mission didn’t take place until 1981. Will our gap only be 6 years or will political and economic factors make the gap longer? What role will the private sector play? Will NASA be relegated to a government regulations industry overseeing private space flight or will NASA again lead the world in launching humans into space? What role does national pride play in modern space exploration? And what about the Chinese, could that be the next great Space Race? Only time will tell but as I watch the final space shuttle mission these and other thoughts will be going through my mind.